1Is a PhD student at the University of Göteborg, where she is writing her thesis about the child figure in contemporary New Zealand literature. She finished my master’s degree at the same university in 2001 and was accepted in the graduate program the same year. She has presented papers at seminars at the Universities of Auckland and Otago in New Zealand, where she was invited for a research visit in 2005. 2Is an Associate Professor of History at Brooklyn College of the City University of New York. She specializes in Modern South Asian History. Her research focusing on gender, domesticity, family history, and class relations in colonial Bengal, India, examines the identity formation of a colonial elite vis-à-vis other subaltern groups such as servants and children. Her book Men, Women, and Domestics: Articulating Middle Class Identity in Colonial Bengal (Oxford University Press, 2004) employs the lens of the employerservant relationships to examine the construction of national identity in colonial Bengal. She also has articles and reviews published in The Journal of Social History, Gender and History, and the Journal of Asian Studies. Further extending her research on family history she is currently working on children and childhood in colonial Bengal. Swapna M. Banerjee received her Ph. D. from Temple University, Philadelphia in 1998 and her ΒA and MA from Presidency College and the University of Calcutta, India. 3Is a professor in the Department of Modern Languages, Literatures and Cultures at Brock University (Canada). She is a member of the Royal Society of Canada and she was president of the International Research Society for Children’s Literature from 1999-2003. She is the author of several books, including De grands romanciers écrivent pour les enfants and Recycling Red Riding Hood. A companion volume to the latter, Crosswriting Red Riding Hood, is forthcoming. She has also edited several other books on children’s literature and Francophone literature. 4Cécile Boulaire est Maître de conférences en littérature pour la jeunesse à l’Université François-Rabelais de Tours. Elle a dirigé le volume Le Livre pour enfants, regards critiques offerts à Isabelle Nières-Chevrel (PUR, 2006); elle est l’auteur de Le Moyen Age dans la littérature pour enfants (PUR, 2002), et de nombreux articles et contributions consacrés essentiellement à l’album illustré pour l’enfance vu comme création poétique et esthétique (dont: “Deux soeurs héroïques de la steppe: la propagande au péril du récit”, Cahiers Robinson n° 17, 2005; “Lavage et patouillage: de la baignoire dans l’album pour enfants”, L’Esprit créateur; French Children's Literature, The John Hopkins University Press, Winter 2005, vol. XLV, n° 4). 5Vit et travaille à Londres. Il est chercheur en littérature enfantine et en théories littéraires à l’Université de Cardiff. Il est membre de l'Association Française de Recherche sur les Livres et Objets Culturels de l'Enfance (Université de Paris XIII), ainsi que de l’International Research Society in Children’s Literature. Il est aussi Reviews Editor pour The Journal of Children's Literature Studies. Parmi ses publications sont New Voices in Children's Literature Criticism, ainsi qu'une série d’articles traitant de la critique enfantiste. 7Is an associate professor of English at Illinois State University, where she teaches children's and young adult literature and critical theory. She is the author of Looking Glasses and Neverlands: Lacan, Desire, and Subjectivity in Children's Literature (Univeristy of Iowa Press, 2004), as well as numerous articles on children's and young adult literature. She is also co-editor of The Gothic in Children's Literature: Haunting the Borders (Routledge, forthcoming 2007), and The Handbook for Research in Children's and Young Adult Literature (Lawrence Erlbaum, forthcoming, 2008). 8Professeur agrégé, teaches in the Department of English at the University of Rouen. Her PhD dissertation (2001) analysed the place of subversion in contemporary British fantasy for children (La Subversion dans la fiction non-réaliste contemporaine pour la jeunesse au Royaume-Uni, 1945-1995). She is the editor of a volume of essays, Perspectives contemporaines du roman pour la jeunesse (L’Harmattan, 2003) and the author of several articles in the field of children’s literature and of some entries in the forthcoming Encyclopedia of Children’s Literature (Oxford University Press). 9Is Professor of English at the Spanish National University of Distance Education (UNED) in Madrid, Spain, where she is Head of the Department of Foreign Languages and teaches American and Canadian literature. She is the author of American Literature to 1900 (Madrid: CERA, 2001), and Literatura Canadiense en Lengua Inglesa (Madrid: UNED, 2004). Prof. Gibert has contributed essays to the collections Τ S. Eliot at the Turn of the Century (Lund: Lund UP, 1994), TS. Eliot and Our Turning World (London: MacMillan, 2001), and DA: Datta: Teaching The Waste Land (Hyderabad: CIEFL, 2001). Her publications on Canadian literature include “Unity in Diversity: Coming to Terms with a Plural National Identity in Canadian Literature” (1996), “Multiculturalism Revisited: Canadian Literary Deconstructions” (1999), “From Obasan to Itsuka: The Power of Silence in Joy Kogawa’s Rewriting of History” (2000), “Narrative Strategies in Thomas King’s Short Stories” (2001), and “The Aesthetics of Ageing in Margaret Atwood’s Fiction” (2005). 10Is doctoral candidate at The George Washington University in Washington, D.C. Her dissertation, "The Islanders: British Paracosms, 1789-1848," explores British imperialism in the imaginary kingdoms of the Brontës, Hartley Coleridge, Thomas Malkin, and the DeQuincey brothers during the era of Geography Militant. She is currently an online adjunct faculty member with the University of Maryland, University College, Adelphi, M.D. 11Associate Professor OAM is Head of the School of Arts and Sciences (Victoria) at Australian Catholic University, in Melbourne, Australia. She has had a wide and varied involvement in the field of children's literature over many years. She has been National President of the Children's Book Council of Australia and is currently President of the Australasian Children's Literature Association for Research (ACLAR). She has judged many literary awards including the Victorian Premier's Literary Awards. She is the joint editor of three collections of short stories, joint compiler of a retrospective anthology published to celebrate 50 years of the Children’s Book Council of Australia Children's Book of the Year Awards, has cowritten several books on using literature with children and is the author of a number of published conference papers. She reviews regularly in a number of children's literature journals and on the radio. She was awarded an Order of Australia in the Queen’s Birthday Honours in 2001 for services to children’s literature. 12Agrégée, Maître de conférences at Bordeaux III University. She wrote her PhD on The Sherlock Holmes Stories by Arthur Conan Doyle. She specialises in late XLXth century British fiction, and has written articles on Dickens, Doyle, Stevenson, Conrad, among others. A book will soon be published entitled: Dickens, l'écriture comme travail, l’écriture comme résistance. 13(Professeur émérite, Université de Tours) started reasearch on African-American fiction as a social discourse with his doctoral dissertation defended in 1981 (Université de Paris VIII): «L’Enfance et l’adolescence chez les romanciers afro-américains, 1853-1969». He has taught American as well as African-American studies at the Universities of Le Mans and Tours in France, as well as at several American universities as an exchange professor. He has contributed articles to a number of journals, and edited or co-edited collections of essays on Jean Toomer (Ellipses), John Edgar Wideman (Callaloo) and African-American detective fiction (CRAFT-2). His most recent contribution is the editing of a collection “Reading Percival Everett: European Perspectives” (CRAFT-4). He is a member of the Collegium for African-American Research committee. 14Gained a Master of Arts degree in English and Educational Studies at the University of Dundee and her Doctor of Philosophy degree in English Literature at the University of Glasgow. Her topic was "Children’s Literature and the Deconstruction of Childhood" and explored the works of Lewis Carroll, J.M. Barrie, C.S. Lewis and J.K. Rowling. She has taught and researched in Further and Higher Education and now works as a Research Fellow in the Institute of Education at the University of Stirling where her interests include wider access activities. 15(PhD, Princeton University, 1996) is Senior Lecturer in the Department of Art History and Theory at the University of Sydney. She has published articles on eighteenth-century art in Art History, Eighteenth-Century Studies and The Burlington Magazine. Her monograph Fragonard’s Playful Paintings: Visual Games in Rococo Art is being published by Manchester University Press, and she co-edited the volume of essays Women, Art and the Politics of Identity in Eighteenth-Century Europe (Ashgate Press, 2003). Her current book project investigates the relationship between concepts of aesthetic play during the Enlightenment and Rococo visual culture. It is supported by funding from the Australian Research Council, the Yale Center for British Art, Columbia University Institute for Scholars at Reid Hall and the National Endowment for the Humanities. 16Born in undivided India shortly before Partition. Since then she has lived, studied and worked in Bangalore, India, Britain, Nigeria, France. She holds a Ph. D., de l’Université de Rennes 2, France; At present she is a member of the University of Le Havre, France. 17Is emeritus professor of comparative literature at the University of Rennes II, France. Her main interests include children’s literature from a literary and historical point of view, reception, adaptation and translation, as well as the relationship between text and pictures. She has written extensively on Lewis Carroll, Sophie de Ségur, Maurice Boutet de Monvel, Beatrix Potter, Jean de Brunhoff and Maurice Sendak. 18Lectures in British area studies at Paris 13. Her thesis was on British children’s reading patterns in the 80s. She is particularly interested in WW2 fiction for children and adolescents, as part of the process of celebration/reconstruction/revision of the period, and has published a number of articles on the topic. 19Teaches English literature at the University of Tours. He is the coauthor, with Nathalie Vincent-Arnaud, of L’Analyse stylistique: Textes littéraires d’anglais (Toulouse: Presses Universitaires du Mirail, 2006). He has also published several articles on the works of Oscar Wilde and Joe Orton. 20Lectures in Translation Studies in the English Department of the University of Montpellier III, France, and is deputy coordinator of the Master de Traductologie. Her main research interests are in the area of literary translation (including children’s literature), audiovisual translation, and the translation of sacred texts, in particular Eastern Orthodox writings. Some of her recent publications are “Archaizing versus modernizing in English translations of the Orthodox liturgy: St. John Chrysostomos in the 20th century” in Translation and Religion. Holy Untranslatable? (Multilingual Matters, 2005), “Audience Design in Translation: Theory and Practice” in On the Relationships between Translation Theory and Translation Practice (Peter Lang, 2005), “Presuppositions in literary translation: a corpus approach” (in Meta. Journal des Traducteurs, 2004) and “Deixis as an interactive feature in literary translations from Romanian into English” (with I. Mason, in Target. International Journal of Translation Studies, 2003). Adriana holds an MA in Translation Studies from the University of Warwick and a PhD from Heriot-Watt University, Edinburgh. Before teaching in Montpellier she lectured in translation at the universities of Middlesex and of Leeds, United Kingdom. 21Associate Professor Shurlee Swain is Reader in History at Australian Catholic University and a Senior Research Fellow in the Department of History. Her most recent publications in the history of childhood include Confronting Cruelty, Melbourne: Melbourne University Press, 2002 (with D. Scott); ‘Infanticide, Savagery and Civilization: the Australian experience’ in D. Cooper Graves and B. Bechtold, Killing Infants: Studies in the Worldwide Practice of Infanticide, Lewiston, Mellen Press, 2006, pp. 85-105 and ‘In whose interest? Voluntarism and child care, 1880-1980’ Australian Journal of Early Childhood, vol. 29, no. 4, December 2004. 22After receiving her Ph. D. has taught in the English Department of the University of South Bohemia, where she lectures in English literature, American literature, children’s literature. Her present research covers the field of Anglo-American gothic and romantic literature and its impact on contemporary fiction as well as literary criticism and theory. 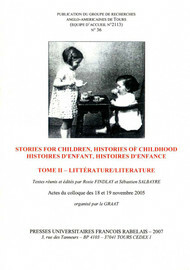 Notices biographiques/Notes on contributors In : Stories For Children, Histories of Childhood / Histoires d'enfant, histoires d'enfance. Tome II : Littérature / Literature [en ligne]. Tours : Presses universitaires François-Rabelais, 2007 (généré le 20 avril 2019). Disponible sur Internet : <http://books.openedition.org/pufr/4983>. ISBN : 9782869064836. DOI : 10.4000/books.pufr.4983. Findlay, Rosie, et Sébastien Salbayre, (dir..) “Notices biographiques/Notes on contributors”. Tours : Presses universitaires François-Rabelais, 2007. (pp. 417-423) Web. <http://books.openedition.org/pufr/4983>.